This month is the second of a six-part series on croning – a feminine rite-of-passage ritual for those reclaiming the power and wisdom of the old woman, the crone. It touches on when, where and with whom to celebrate. Croning can be a done alone or before a group. That group can include only women, a community such as a grove or a coven, or family and friends. It can include a formal circle, a picnic or a restaurant dinner. In other words, it can be be anything the crone wishes. The crone rules the dark of the year (from Mabon to Yule or even up until mid-January). It’s her time of power. It’s also the time of death. The crone creates the ending so the maiden can begin again. The waning moon (from full to new) is also a time of gathering darkness, hence it is also the crone’s time. Planning a ceremony to coincide with those energies would be a natural choice. Other dates that might be significant include a birthday, the anniversary of the day you committed to your path, or the day you initiated an ending. You could also hold a croning by yourself at the stroke of astrological Samhain or with hundreds of witnesses as part of a pagan festival. I had to choose between croning during an annual Mabon weekend retreat with about 20 magical women, primarily witches, or to have it at Samhain so that I could also invite some family and friends – including men – who would not be part of the retreat. As much as I wanted to be able to share my croning with a few very special non pagans in my life, I chose the Mabon weekend because that clan comes from far and wide I knew the chances of them all gathering again six weeks later were slim. Choosing the Mabon retreat also meant a lot of the logistics were already taken care of. I recently participated in a handfasting where about a quarter of the attendees were witches. We set up the altar, cast a small circle, called the quarters and performed the sacred rite while family and friends watched. Something similar could be arranged for a croning ceremony, or you could choose to include everyone in the circle. If you have a mixed group, you might want to give more details, instructions and explanations before and during the ceremony so that everyone understands what is occurring and what is expected of them. Consider providing an outline along with the words to any responses, chants or songs. Two crones worked with me as I moved through the process of discussions, decisions and doings. We met a couple of times over breakfast to talk about accepting the mantle of pagan elder and the work I would would perform in preparation. Then I was told that everything else was out of my hands. More years than not, I’ve planned the weekend’s worth of rituals, sometimes alone, sometimes with others. I had begun to plan my croning ritual, and had even picked up a book on the topic. It was surrendered along with the Mabon ritual from the previous year … and part of my training was to practice letting go. It was not an easy lesson. I spent time creating a Facebook page called Cauldron of Care (which you are invited to join) and another called Council of Crones (which has yet to be perfected). With the help of a carpenter, I made a staff. While it’s common to gift the crone, this crone wanted to gift, so I worked to make wisdom scrolls and flower essences, and wrapped the most awesome old witch cameo pins to give to my sister crones. I was asked two more questions: was there a symbol of cronehood I wished to be presented with (I chose a shawl, which a friend was making as a gift), and which of the crone Goddesses I wished to call (I chose the Norns). You might well have the opportunity to plan more of your own ritual. You can find books and websites with a wide variety. You are free to pick and choose parts of them, incorporating as many components as are important and meaningful to you into your own ritual. What you want could determine where the event is held: a room at a restaurant, a rented hall, a living room or a place in nature – keeping in mind any challenges your guest may have. 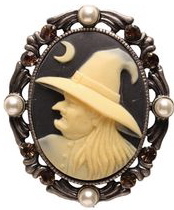 Next month I’ll write about crone symbols. July will prompt you to reflect on your life and the wisdom you have to share. My croning ritual will be a large part of the August column, along with some ideas for your own and some references. We’ll wrap up in September with any questions you may have as well as some details that did not fit into previous columns.